Hunter has now had all the details added and is ready to go into the silicone. Door handles are from my Herald estate and the body moldings are micro strip. Fuse wire is better for the rain guttering as it is easier to bend into shape. Since the pictures on page 1 the front wheel arches have been reshaped and a front bumper made from a modified Avenger one. 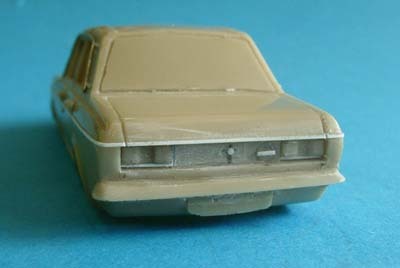 It's important to remember that if you intend to cast bumpers as one with the bodyshell that you fill in any gaps between the bumper and the body otherwise silicone will wrap around it and you won't get it out without destroying the bumper and damaging the mold. Door/bonnet etc gaps were created using steel ruler, scriber and then finishing with Bare Metal Foil panel scriber (highly recomended). Rear end showing recess cut for tail lights. One tailight was carved from plastic and then copied for the other side.Boot lock is 1mm plastic rod in pre drilled hole. A neat way of creating the circle for the petrol filler cap is to use a wad punch of a suitable size and rotate this with moderate pressure onto the resin. This scribes a neat circle to which a plastic strip handle is added. Next jobs are the making of a plug to vac form the window unit (hardest part I think) and the making of masters for the grills. 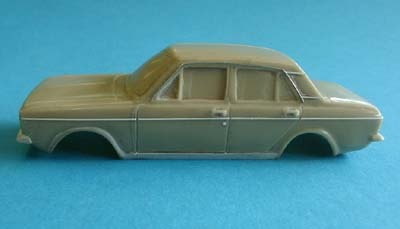 Three grills are to be made, one with two square headlights for the late 60s Hunter, another with square lights but different grill for the Singer Gazelle and Vogue variants and one with two round lights for the Minx and very early Hunters and was the type used on the London to Sydney Marathon car. On this last type as on the real car the 7" headlights extend outside of the normal grill recess so minor modifications would have to be made by the end user to the bodyshell. The other two types should drop straight in unaltered.